It’s always great to have quality time with Miss Teen. Today was no exception as we enjoyed morning tea at one of our favourite places. 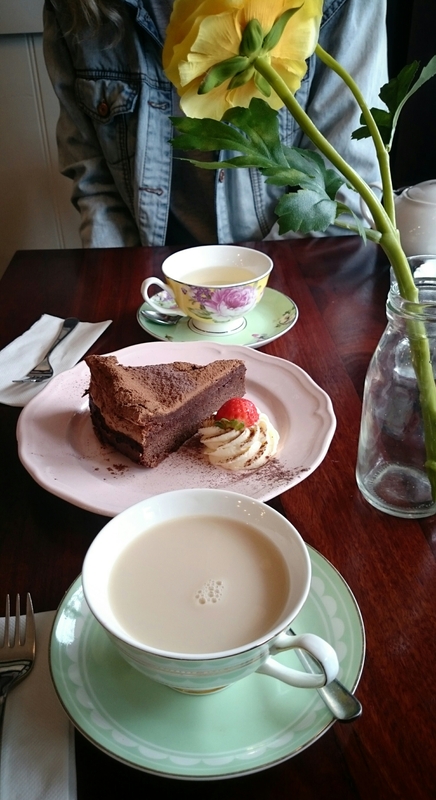 After too much Tea and a lovely piece of chocolate meringue cake was consumed Miss Teen became the photographer before we went and watched INSURGENT. INSURGENT is the second movie in the Divergent series. If you enjoyed the first movie ; Divergent, then you will really like this one.It has plenty of action and a great storyline. Have I mentioned that I am really liking the gorgeous flats available from Target at the moment and these ones are so comfy and affordable – $25. I am wearing size 11. 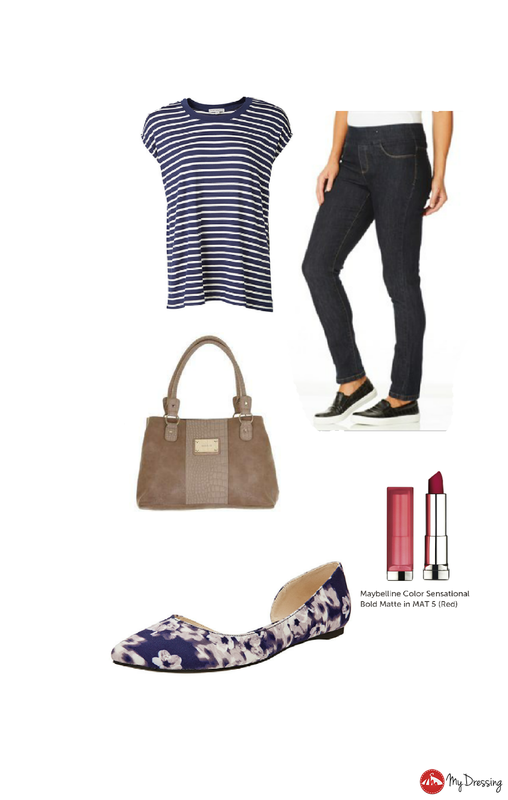 I added a touch of Nautical look, with this peacoat striped t-shirt also from target – $25. My bag (strandbags) , was a gift for Xmas from mr T&T and not available now but the one featured (Marikai snake panel tote) is very similar. A touch of RED was added with my new lipstick. If you have been wanting to try out the lovely shades of red that are out but think that they might make you look washed out or won’t suit you then I encourage you to go to your local makeup counter and try some out. The lipstick I wore is RED matte from maybelline. A bit of sharing ( not sponsored) Target currently has 30% off selected makeup. 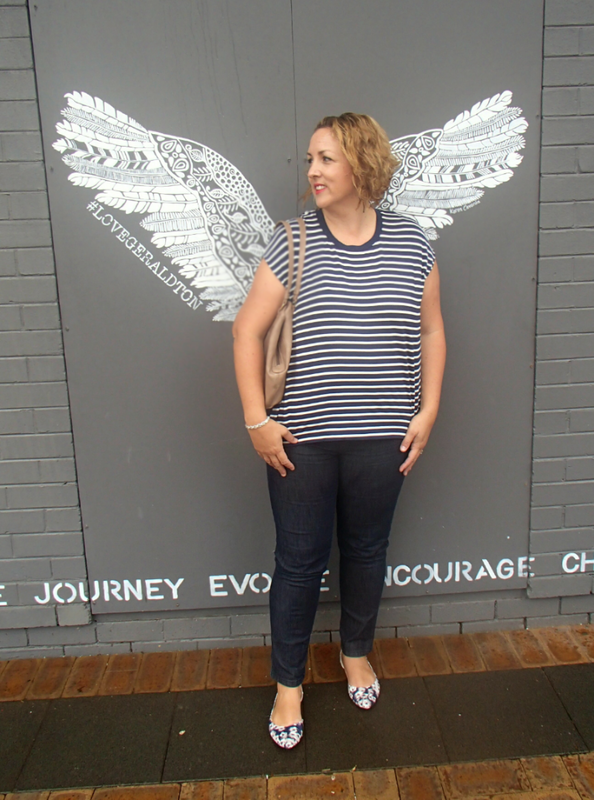 Don’t forget to share your outfits on Instagram : #wearandsharet. I look forward to seeing what beautiful, comfortable and affordable outfits you put together.